Middlesex County Crime Stoppers offer reward for info on female duo who stole over $600 of merchandise from local supermarket. Middlesex County Crime Stoppers, in conjunction with the South Brunswick Police Department, are seeking the public’s assistance with identifying two females who stole over $660 worth of merchandise from a local supermarket. On Saturday October 8, 2016 the two females entered the Stop and Shop (24 Summerfield Boulevard in Dayton) and stole over $600 worth of razorblades. The two females were seen on video surveillance walking into the health and beauty isle and removing the merchandise off the shelves. The females then place the razorblades into a purple tote bag and then seen leave the store without paying. The first suspect can be described as a white female approximately 5`3, with light brown hair, wearing glasses, a black short sleeve batman t-shirt, blue jeans and flip flops. The second suspect can be described as a white female approximately 5`3, with light brown hair, wearing glasses, a black sweatshirt, gray sweatpants and sneakers. Both females appear to be in their late teens to early twenties in age. 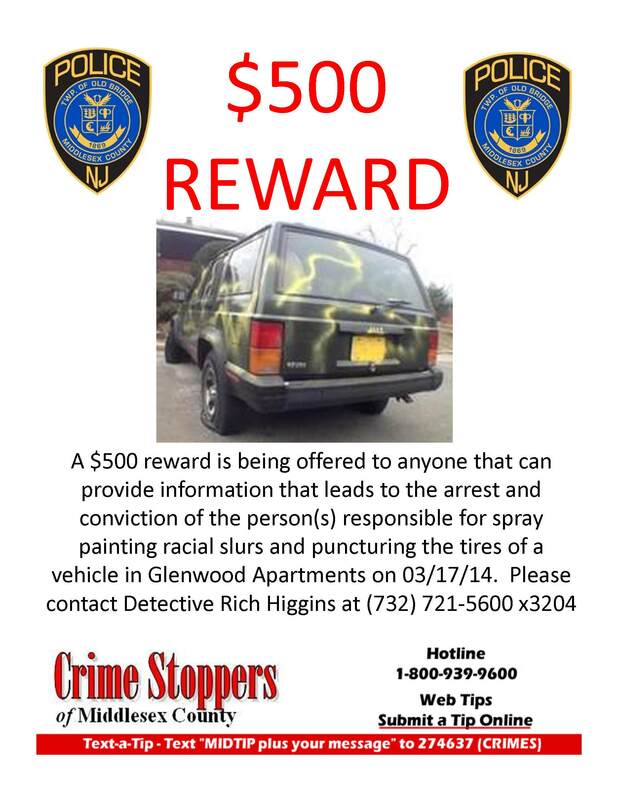 Crimestoppers is seeking your help in apprehending person or persons responsible for an act of grafitti upon a vehicle located in the Glenwood Apartments in Old Bridge Township on March 17, 2014. The vehicle was spray painted with racial slurs and the tires were punctured by unknown persons. On 07/07/2011 at approximately 1:00 am a 68 year old male was walking home when he was robbed at gunpoint on the corner of Lewis Street and Brighton Avenue. During the robbery he was struck numerous times over the head with the handgun. Suspects are Hispanic males. THE NEW BRUNSWICK POLICE DEPARTMENT IS INVESTIGATING AN AGGRAVATED ASSAULT THAT OCCURRED ON THURSDAY JULY 21, 2011 AT APPROXIMATELY 11:40PM IN THE PARKING LOT OF NEW JERSEY BOOKS LOCATED AT 39 EASTON AVENUE. THE VICTIM AND A FRIEND WHERE WALKING IN THE PARKING LOT WHEN AN OLDER STYLE BLACK TOYOTA CAMRY PULLED INTO THE LOT AND ALMOST STRUCK THE VICTIM. THE VICTIM CONFRONTED THE DRIVER OF THE VEHICLE AND A PASSENGER FROM THAT VEHICLE BECAME INVOLVED IN THE ARGUMENT. A SHOVING MATCH ENSUED AND ALL PERSONS INVOLVED ENDED UP ON THE SIDEWALK AREA IN FRONT OF THE BUSINESS. THE WITNESS STATED THAT A TOTAL OF FOUR INDIVIDUALS HAD EXITED THE CAR. ONE OF THE SUSPECTS WAS SEEN GETTING A BLACK OBJECT OUT OF THE TRUNK OF TRHE CAMRY. THE VICTIM WAS STRUCK AND FELL TO THE GROUND. THE VEHICLE LEFT THE AREA AFTER THE ASSAULT OCCURRED. THE SUSPECTS WERE DESCRIBED AS BEING EITHER MIDDLE EASTERN OR OF ASIAN DECENT (DESCRIBED BY WITNESS AS POSSIBLY BEING FROM INDIA) WITH ONE OF THEM NAMED SIMON OR SMON. A DARK SKINNED MALE WITH SLICKED BACK HAIR, 5`6" TALL, STOCKY BUILD WEARING A T SHIRT. A BROWN SKINNED MALE WEARING A FITTED HAT, 6`2" TALL WEIGHING BETWEEN 170 AND 180LBS WEARING A WHITE SHIRT. MALE WEARING SOME TYPE OF BLACK HEAD GEAR, 6`2" TALL WEIGHING 250LBS. On February 16, 2011 the remains of a 72 year old man were targeted by unknown persons at the Most Holy Rosary Cemetery located in the Fords section of Woodbridge Township. Investigators beleive that the persons responsible engaged in a "Non-traditional religious practice". 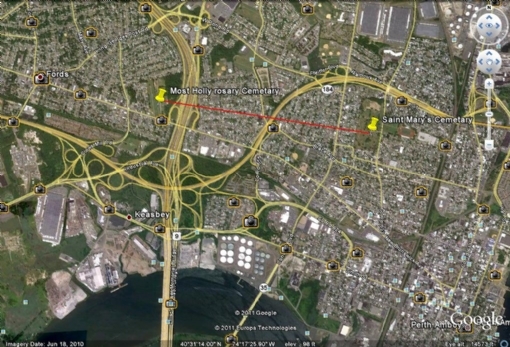 Both cemeteries are located a short distance from each other on the Woodbridge/Perth Amboy border. In 2007 the Piscataway Township Police Department and the Middlesex County Prosecutors Office began the investigation of a Sexual Assault that occurred sometime during the early morning hours of July 4th. The victim told investigators that she was at her residence in Piscataway, which is near the <?xml:namespace prefix = st1 ns = "urn:schemas-microsoft-com:office:smarttags" />Plainfield border, and went to sleep. Sometime during the early morning hours she awoke to find a man standing next to her bed. The suspect assaulted the victim and the victim struggled with her assailant. The suspect then sexually assaulted the victim. After the assault the suspect made comments to the victim that he wanted to go to East Orange and then changed the location to Newark. The victim drove the suspect in her car to the area of Meeker Street and Broad Street in Newark. The suspect demanded cash from the victim. The victim used her ATM card to get cash for the suspect. After receiving the money the suspect had the victim drop him off in an area that she described as both industrial and residential (Which was later determined to be by the Seth Boyden Public Housing Complex). The suspect was described as a black male, approximately 5’10” tall, clean shaven, short hair, with a crevice in his forehead, a full face. The suspect weighed approximately 235 to 240 pounds and had broad shoulders, large arms with a slight belly and was approximately 25 to 35 years old. The suspect was wearing a short sleeved sports jersey with a number on it. If anyone has any information on this crime please submit a tip through this web site. (The map shows the location of the Seth Boyden Housing Complex in Newark).